Edited. I meant to say Top 25 games via the AP Poll. The American Athletic advertised themselves as "Power Six" while on ESPN News, and Villanova, who plays Football in the Colonial Athletic Association of FCS, won 19-17 at Temple. again that conference could not get an important win when they needed it. And Xichigan starts 0-1. It's already a good start to the season. RIP Pete Cheng; the commish will be missed. Why? Jalen who? Tagovailoa is picking up where he left off since coming in the 2017-18 College Football Playoff National Title Game. 227 passing yards, 2 TD, 0 INT and also catching a touchdown pass in the Tide's 51-14 romp on the Louisville Cardinals could make Jalen Hurts switch positions. Why? A lot of turmoil in College Park during the summer, but that didn't stop the Terps from beating Tom Herman's Texas Longhorns again. Why? Auburn grabbed a win outside the SEC and boost their chances for a spot in the College Football Playoffs. Why? Not a good start in Year #4 in the Jim Harbaugh era in Ann Arbor after a loss to the Notre Dame Fighting Irish. Shea Patterson thought he was the answer for Harbaugh in the QB position, but he disappointed being responsible for both Michigan turnovers. Why? Another loss to Maryland for Herman and the Texas Longhorns. Herman is piling his offensive woes on his offensive coordinator. Yikes. As for Kelly in Westwood, the UCLA Bruins QB situation doesn't look promising after UCLA lost to the Cincinnati Bearcats. Why? Washington still has lots of time to make up after their competitive loss to Auburn, but they need to run the table including winning the Pac-12 title game in a beat the living crap out of each other Pac-12 to get the conference's bid in the College Football Playoffs. Ole Miss scored 76 with fewer first downs than Southern Illinois, who scored 41.
with all that money they spend on players. Love Boise state this week. A couple of Top 10 teams via the AP Poll suffered incredible blows to their playoff chances this week. #12 LSU stunned rivals #7 Auburn inside Jordan-Hare on a last-second field goal while BYU tripped up #6 Wisconsin in Madison when the Badgers missed a field goal late. Jarrett Stidham also cost Auburn with two interceptions. U$C can't beat a team that Maryland did. LOL. 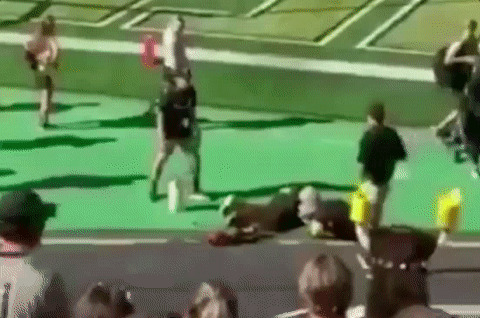 Colorado's mascot provides an important lesson in (t-shirt) gun saftey - make sure you know which end is up.